Most of the items listed in the Information Analysis section of the home page are reportable fields in Incident. Select the Type of Reporting Date. This selection will affect how the system views your date range entered previously. For example, if you select Request Date, the system will look for incidents requested within the date range selected. But if you choose Completion Date, the system will only report on incidents completed within the date range, regardless of when it was requested. 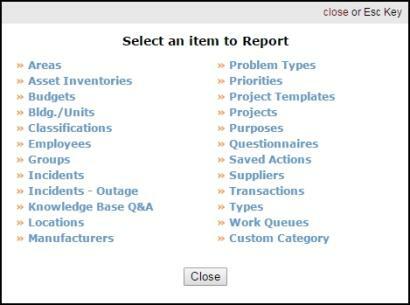 The Incident Summary 2 Report is a great report to run. Almost any information you are looking for can be found in this report. It gives a nice breakdown of each incident that meets your report criteria: the status, the current "assign to", the requester, the days aged, labor hours, and total costs accrued. Depending on how you sort your results, you will get a total for each "grouping" and then a grand total for all the incidents combined. The Transaction Detail Report is another great report in Incident. This report gives a breakdown of transactions entered on incidents for a specified reporting period and includes information such as the incident description, transaction description, quantity and unit cost of labor and/or materials.